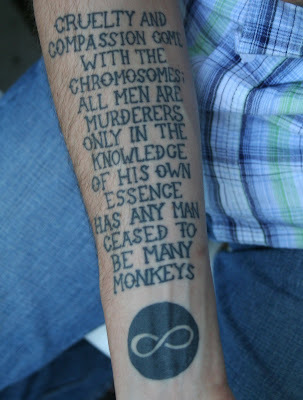 "Cruelty and compassion come with chromosomes; All men are merciful and all are murderers. Doting on dogs, they build their Dachaus; Fire whole cities and fondle the orphans; Are loud against lynching, but all for Oakridge; Full of future philanthropy, but today the NKVD. Whom shall we persecute, for whom feel pity ? It is all a matter of the moment's mores, Of words on wood pulp, of radios roaring, Of Communist kindergartens or first communions. Only in the knowledge of his own Essence Has any man ceased to be many monkeys." Interesting tattoo, Kimy - what does it say on your other arm? Aldous brings a powerful gospel, Kim. And you're right about naming. Most monkeys are more civilized than many men (and some women). Wow! That is just the most original and amazing tattoo I've ever seen. I think I did pretty good on my first modeling job.